In Bolivia cultures are very diverse and although most foreigners tend to think of Bolivia as a predominantly Andean, Aymara or Quechua country, there are actually 36 indigenous cultures in our country, each with their own customs, and most with their own languages. In a country of 10 million inhabitants, about half (5 million) identify with a Bolivian indigenous culture, and the remaining 50% of Bolivians identify themselves as white or “mestizo” (indigenous and Spanish mix). Many more are descendants of immigrants from Europe and numerous other parts of the world. The Bolivian indigenous cultures are divided into three geographical groups: those who inhabit tropical forests, which we call the Amazonia, those who inhabit the Andes Mountain region, and those who come from the southeastern dry Chaco region. Of these, the largest ethnic groups are the Aymara (who number just over 2 million), the Quechua (who number over 2.5 million), and the Chiquitano (who number over 180,000). 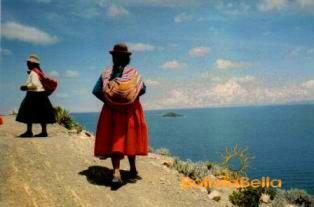 The following is a summary of the Bolivia cultures present in this nation. The Quechua are the largest culture of Bolivia. They are native to Chuquisaca, Cochabamba, Potosí, Oruro and La Paz. They number over 2.5 million and their language is Quechua. They are mostly farmers and cultivate numerous varieties of corn and potatoes, quinoa, and other tubers, although their most lucrative crop by far is coca. They also practice animal husbandry. The Aymara are the second largest Bolivian indigenous culture and are native to La Paz, Oruro and Potosi. They number over 2 million and their language is Aymara. Their sources of income are agriculture, animal husbandry, mining, fishing, handcrafts, and trade. The Uru Uru culture is native to the area of La Paz and Oruro, which was named after them. There are fewer than 3000 of this population remaining. They speak the Uru language and mostly work in animal husbandry and the production of handcrafts. The Guarani are the fourth largest Bolivian culture, numbering just under 180,000. 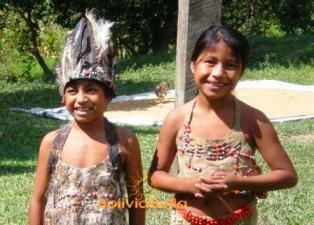 They are native to the departments of Santa Cruz, Chuquisaca and Tarija and their language is Tupi Guarani. They work mostly in subsistence agriculture and cultivate corn, rice, beans, sugar cane, cotton, manioc, and other crops. They are well known for their woven handcrafts as well. The Tapiete are a tiny, almost extinct culture that inhabit a small town near Villamontes, in the Chaco region of Tarija. There are under 70 of them left. They practice fishing, gathering and agriculture and speak a Tupi Guarani language. The Weenhayek culture also resides in the Chaco and Yacuiba area of the Chaco in Tarija and their language is Weenhayek. They have a population of slightly over 2000 and mostly practice fishing, gathering, subsistence agriculture, and handcrafts. The Afrobolivians are descendants of slaves and inhabit the Yungas tropical forest region in Northern La Paz. They number about 20,000 and most speak Spanish or Aymara, having lost their African traditions centuries ago. 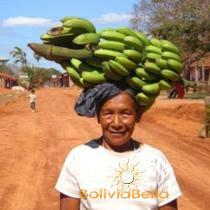 They work mostly in agriculture, cutivating coca, manioc, bananas, citrus fruits, and rice near Coroico. 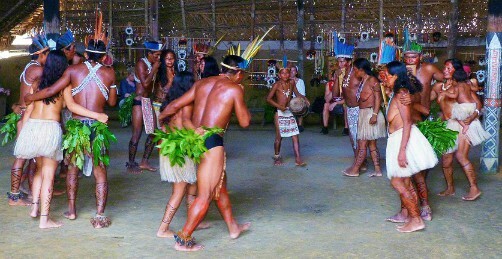 The Araona culture inhabits a single community near Ixiamas, in the department of La Paz and speak the Tacana language. There are only about 120 of them left. They are still hunters, fishers and gatherers, producing mostly fruit and nuts. The Ayoreos culture from the Chiquitos region of the department of Santa Cruz. 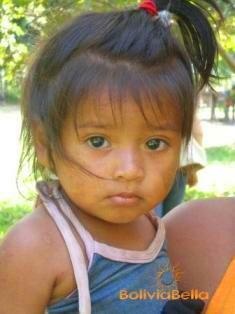 Their population is under 1800 and their language is Ayoreo, of the Zamuco language family. They are practice subsistence agriculture and often can be seen selling handcrafts on the streets of Santa Cruz and Concepción. The Baure live in the Itenez region of the department of Beni and once numbered over 16,000 when Jesuit missionaries grouped them into mission towns. However, they now number under 1000. They speak the Arawak language. They practice subsistence agriculture and produce chocolate from natural cacao. The Canichana are a small group of under 500 and their language family has not been identified. They inhabit small towns near San Javier in the department of Beni and produce agricultural products such as rice, corn, beans, manioc and bananas. The Cavineño inhabit both Beni and Pando near the Madre de Dios and Manuripi rivers. They number about 1700 and practice subsistence agriculture, cattle ranching, and gathering. They speak the Tacana language. The Cayubaba are also from Beni and live in the province of Yacuma. They speak the Cayubaba language and practice subsistence agriculture and cattle ranching. They grow rice, corn, beans and squash and produce manioc flour. The Chacobo live near Riberalta, in the department of Beni and there are fewer than 500 of them left. They speak the Pano language and grow Brazil nuts, hearts of palm, rice, corn and manioc. The Chimané culture, also of Beni, inhabits the provinces of Ballivián, Moxos and Yacuma. Their language is Chiman. They are primarily fishermen and collect wood and palm fronds. The Chiquitano are Bolivia’s third largest culture, numbering over 180,000. They inhabit the vast Chiquitos region of Santa Cruz where the Jesuits established dozens of mission towns such as San Xavier, Concepción, San Ignacio de Velasco, and others. They speak the Chiquitano language and are primarily farmers, growing corn, rice, manioc, cotton and bananas, although they are also skilled musicians and were taught to fashion violins by the Jesuits. These are the towns where Bolivia’s famous International Baroque Music Festival takes place every two years. The Esse Ejja live near the Madre de Dios River in Pando and fewer than 500 of them remain. They speak the Tacana language. They hunt anteaters, wild pigs and monkeys, gather turtle eggs, honey and fruit, and fish for sardines, dorado and catfish. The Guarasugwe are almost extince as a culture. There are fewer than 50 of them left. They live in Magdalena, in the department of Beni and in Concepción in Santa Cruz. They speak the Tupi Guarani language and are primarily hunters, fishers and gatherers. The Guarayos number nearly 10,000 and live in the Guarayos region of northern Santa Cruz in numerous towns near Urubichá. They speak Tupi Guarani and mostly practice subsistence agriculture and animal husbandry, although they also fashion violins as taught them by the Jesuits. The Itonama inhabit the provinces of Itenez and Mamoré in the department of Beni and number roughly 3000. Their exact language family has not been clearly identified and seems to be unrelated to any other identified in Bolivia. They grow corn, manioc, bananas, citrus fruits, and several other crops. The Joaquiniano live near the Mamoré River in the department of Beni and speak the Arawak language. They grow corn, rice, manioc and bananas and live in several towns. They number a little over 3000. The Leco culture of Bolivia live in the provinces of Larecaja and Franz Tamayo in the department of La Paz. They speak the Leco language, also known as Lapa Lapa. They number about 2800 and they practice cattle ranching, agriculture and forestry. The Machineri culture of Bolivia is nearly extinct. There are fewer than 200 left. 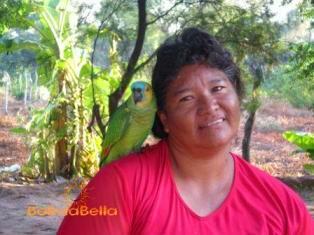 They live in the town of San Miguel in Pando and speak an Arawak language. They are hunters, fishers and gatherers. The Maropa number just under 4500 and live in several communities in the province of Ballivián in the department of Beni. They speak the Tacana language and practice subsistence farming, cattle ranching and forestry. The Moré live near the Mamoré River in the department of Beni. There are only about 100 of them left and they speak the Chapacura language. They grow rice, corn, manioc and bananas. The Mosetén culture of Bolivia is divided into two regions. Some live in the Sud Yungas region of La Paz and others in the province of Ballivián in the department of Beni. Their language family has not been classified their total population is under 1600. They practice agriculture and grow corn, beans, vegetables and fruit. The Movima are a fairly large Bolivian culture and number over 10,000. They inhabit the province of Yacuma in the department of Beni and their language is unrelated to others found in Bolivia. They are primarily farmers and grow corn, rice, beans, manioc, bananas, squash and sweet potatoes. The Moxeño culture of Bolivia was once a grand and sophisticated culture believed to have numbered over 8 million at one point. They speak the Arawak language and are native to the department of Beni. They number about 80,000 now and they are known as Bolivia’s “water” culture as they built over 20,000 hills and channels over an extensive area as part of a sophisticated water collection and irrigation system. Their population was decimated when the Spaniards arrived in search of the infamous El Dorado fountain of youth. The Nahua is a tiny culture that lives near the Manuripi River in the department of Pando. Their language is also called Nahua. They are hunters and gatherers and their exact population totals are unknown. They are hunters, fishers and gatherers. The Pacahuara live near Riberalta, on the border between Beni and Pando. There are under 30 people of this Bolivian culture left. They used to be very numerous and fiercely resisted being evangelized by Spanish missionaries. They live in the villages are Tujuré and Santa Ana and speak the Pano language. They grow Brazil nuts and hearts of palm. Their population was decimated by the Spanish who enslaved them to work in on haciendas producing rubber and executed those who tried to escape. The Sirionó live in the community of Iviató in the department of Beni. They number about 300 and speak Sirionó, a language of the Tupi Guarani family. They hunt and fish and collect honey. The Tacana inhabit provinces in both La Paz and Beni and number over 7000. They speak the Tacana language and practice agriculture, growing rice, manioc, bananas, and other fruits. Archeological evidence indicates they are a very ancient culture, prehistoric in fact. The Incas destroyed their invaded and destroyed the structure of their population. The Toromona are a nomadic culture that inhabit the province of Iturralde in the department of La Paz. Little else is known about them other than they exist as no real contact has been made with them. The Yaminahua live in the province of Nicolás Suárez in the department of Pando and number less than 150. They speak the Pano language and are mostly hunters, fishers and gatherers. The Yuqui live near Carrasco National Park in Cochabamba and number under 250. They are hunters, fishers and gatherers and also produce handcrafts. They make bows and arrows, handbags and hammocks. They are the last of the Tupi Guarani peoples to have been found. Contact was made with them for the first time in 1967. The Yuracaré live in the Chapare and Carrasco regions of Cochabamba, and one group lives far away in the Moxos region of Beni. They number about 2800. Their language is Yuracaré and they practice subsistence agriculture. Mestizos are people who are of mixed race. In Bolivia, most mestizos have some Spanish ancestry but there are also very large Bolivia cultures that are descendants of German, Japanese, Lebanese, Chinese, Korean, Italian, French, Dutch, Swiss, Canadian, Brazilian, North American, British, Irish, Croatian, Lebanese, and Jewish immigrants, and many others. Some of these communities are very large and well established in limited areas, such as the thousands of German Mennonite families who inhabit dozens of colonies.